On my way to a routine hospital appointment, I’m strolling down a suburban street when I spot a perfect pine cone lying on a grass verge. Now, I cannot pass a nice pine cone any more easily than I can ignore a conker, freshly dispensed in all its shiny glory from the spiky lime-green case in which it’s been lying, fattening, since Spring. I slip the pine cone into my pocket, glad to be distracted from my imminent arthritis check-up. I’ve been a bit creaky lately and I’m not looking forward to my consultant’s review. 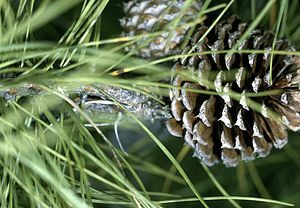 Pine cones, in contrast, are full of the promise of good things. Promise of cosy, autumn firesides; of sustenance for small birds in winter; of nourishment for squirrels as they bulk up for hibernation. Pine cones are a forerunner of Christmas, but in a more subtle way than the charity gift catalogues that have been landing on my doormat since July. I always plan to collect and decorate pine cones and string them on the Christmas tree with tartan ribbon. If my daughter gets her way, they’ll be adorned with fake snow and glitter too. Or else we’ll douse them in melted fat, roll them in seeds and crumbs, and suspend them with string from trees outside our living room window. They provide an oasis for hungry birds on short, dark winter days and it’s a pleasure to watch from inside a warm house. There’s an unnatural neatness about the shape of a pine cone. They’re reminiscent of the children’s drawings of Christmas trees that subdue nature’s disorder into a more manageable form. But even so, a pine cone is a pine cone is a pine cone. Or so I thought until last weekend, when, on a walk in a Penzance park with my father, I learned to appreciate the pine cone in a different way. Just turned 80, he is a long-time lover of trees and their diversity. Stooping to collect a pine cone from the ground, he gives my nine-year-old daughter a spontaneous lesson in the identification of the originating tree, based on the arrangement and distribution of its spikes. Unlike me, my father has an artist’s eye, full of wonder at the natural architecture of the world about us. An accomplished watercolourist, woodturner, carpenter and calligrapher, he has a keen understanding of the complexity of the tree’s task in creating what it has so casually dropped in our path. No matter what your religious beliefs, when you’ve heard my father hold forth about trees, you can’t help but be in awe of nature. His childlike sense of wonder is not restricted to trees. He’s ready to detect a miracle in everything he sees in the natural world. I believe this attitude is one of many reasons why, at the age of 80, he remains so youthful in spirit and outlook – and why my small daughter relates so readily to his world view. She is as close to him as his shadow. They spend many happy hours together. Lately he’s taught her to paint in watercolours. 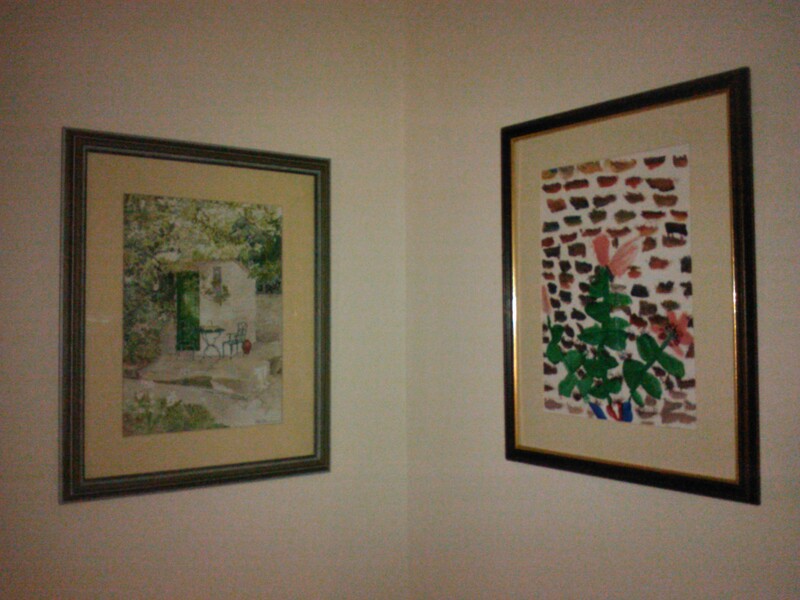 We have a pair of paintings, one by him, the other by her, hanging in our living room, natural companion pieces. This summer, each of them took first prize in their respective age groups in the “original painting” category of our local village show. I see echoed in their relationship the closeness of my connection with my own Grandma, my father’s mother. 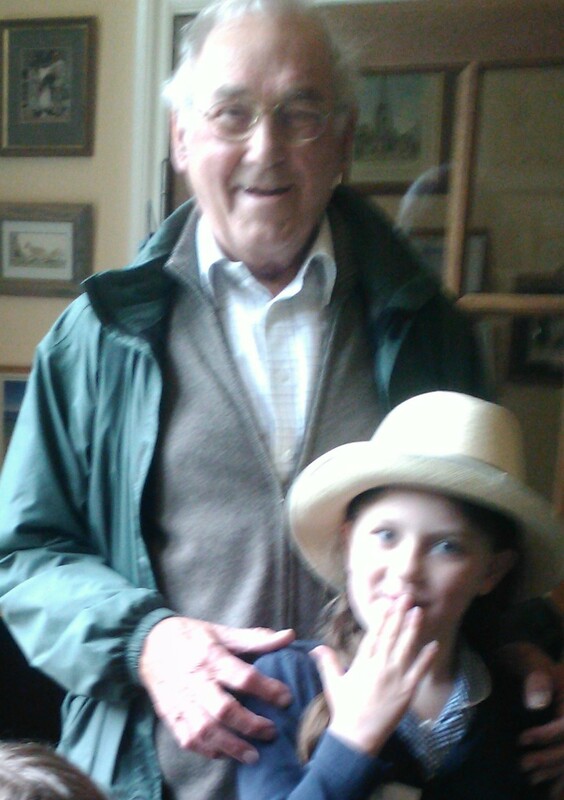 It seems the baton of the bond is being handed down the generations. So, with my pine cone resting snugly in my pocket, I settle down in the hospital waiting room, beginning to feel a little more optimistic about my appointment. I know I can depend upon my lovely consultant to be supportive, and I’m sure she’ll have some sound advice for keeping me young by nature, as well as young by name. I want to make sure that when my turn comes to connect with my grandchildren, I’ll be ready to rise to the challenge. Goodness knows, I’ve got a hard act to follow. This post originally appeared in the Tetbury Advertiser, October 2012 edition. Fiona, thank you so much for such a lovely comment – very glad to share the joy of autumn with you! Enjoying your new blog too, btw – have just added it to my Google Reader – and tweeted your Letter to Procrastination – brilliant! Beautiful in so many different ways. You are an artist by the way when it comes to words. I love pine cones and conkers too as my late Mum made them magical. No comment could say how wonderful your post it. Kate, thank you so much – your comment has made my day! I’m really glad you enjoyed my post. Pine cones and conkers are so timeless, aren’t they? And acorns too – fond memories of making tiny dolls’ furniture with acorns, acorn cups and pins. I hope you won’t mind if I add part of your kind comment to my list of my favourite comments in the sidebar here. Hi Debbie, you’ve got a wonderful father and I love Laura’s picture. Hope your appointment went ok – I hope you don’t mind me asking, is it rheumatoid or osteo? Hi Sally! Thank you so much for commenting and for your kind comments! The arthritis appointment was fine, thanks – I’m lucky enough to have a fabulous, sensible, rheumatologist who speaks to me as if I’m as intelligent as she is (she flatters me!) She has made an incredible difference to my ability to cope with my rheumatoid arthritis, and I’m lucky that it was caught very early and is (touch wood) well controlled and effectively medicated. I was diagnosed with RA four months before my daughter’s diagnosis of Type 1 Diabetes. She was aged 3 at the time. If she’d been born 100 years earlier – or indeed in the present day but in an impoverished developing country – she’d have been dead before her fourth birthday. That also puts my own condition into perspective. We are very glad that we live in 21st century Britain – the NHS and modern medicine have been very good to our family! I love pine cones too – and what a fab photo of your Dad! Thanks, Helena! 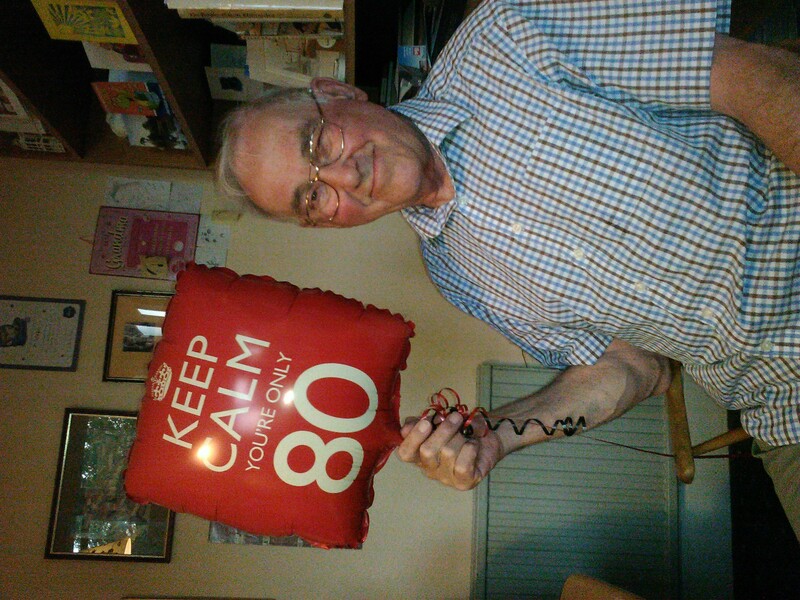 As you can see, my dad had a very happy 80th birthday – definitely 80 years young! Such a gorgeous post, Debbie. Your family just sounds so amazing. Had to look up conker, though — had never heard that one for chestnuts! Hi Debbie-wonderful story and thanks for the pine cone feeder info. Beautiful watercolour paintings by your father and Laura. Laura has a great eye for detail creating a story in her painting. I envy the patience and delicate hold on the brush your father has.Myself, I do acrylics. I hope all is well with everyone. Thank you yourself for your stories. I look forward to reading more. Best wishes for the oncoming season. Hello Debbie, lovely to hear from you again! Nice that you paint too – I can’t paint at all and have always wished I could! Thank you for commenting – always nice to see your name pop up in my inbox 🙂 Best wishes, the “other” Debbie Young!